Dr Cox studied at Clare College, Cambridge (1990-4), and graduated with a BA(Hons) degree in Mathematics, followed by a Certificate of Advanced Study in Mathematics. He spent the next three years preparing his PhD at Queen Mary and Westfield College, University of London, graduating in 1997. 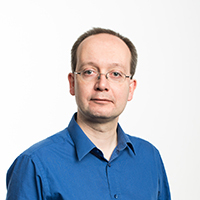 After working in Oxford, Stuttgart, and Bielefeld, he joined the Mathematics Department in 1999. He is currently Head of Department. Dr Cox's research interests lie in representation theory, where he studies representations of algebraic groups and related algebraic objects. Recent collaborations have involved researchers in Australia and China, as well as at City and elsewhere in the UK. Dr Cox is a member of the Representation Theory research group in the Centre for Mathematical Science. Cox, A.G. (2016). Introduction to Representations of Algebras and Quivers. Algebra, Logic and Combinatorics World Scientific. ISBN 978-1-78634-032-0. BOWMAN, C. and COX, A.G. (2018). MODULAR DECOMPOSITION NUMBERS OF CYCLOTOMIC HECKE AND DIAGRAMMATIC CHEREDNIK ALGEBRAS: A PATH THEORETIC APPROACH. Forum of Mathematics, Sigma, 6. doi:10.1017/fms.2018.9 . Bowman, C., Cox, A. and Speyer, L. (2017). A family of graded decomposition numbers for diagrammatic cherednik algebras. International Mathematics Research Notices, 2017(9), pp. 2686–2734. doi:10.1093/imrn/rnw101 . Bowman, C. and Cox, A. (2014). Decomposition numbers for Brauer algebras of type G(m, p, n) in characteristic zero. Journal of Pure and Applied Algebra, 218(6), pp. 992–1002. doi:10.1016/j.jpaa.2013.10.014 . Bowman, C., Cox, A.G. and De Visscher, M. (2013). Decomposition numbers for the cyclotomic Brauer algebras in characteristic zero. Journal of Algebra, 378, pp. 80–102. doi:10.1016/j.jalgebra.2012.12.020 . Cox, A. and De Visscher, M. (2011). Diagrammatic Kazhdan-Lusztig theory for the (walled) Brauer algebra. Journal of Algebra, 340(1), pp. 151–181. doi:10.1016/j.jalgebra.2011.05.024 . Cox, A., De Visscher, M. and Martin, P. (2011). Alcove geometry and a translation principle for the Brauer algebra. Journal of Pure and Applied Algebra, 215(4), pp. 335–367. doi:10.1016/j.jpaa.2010.04.023 . Cox, A., De Visscher, M. and Martin, P. (2009). A geometric characterisation of the blocks of the Brauer algebra. J LOND MATH SOC, 80, pp. 471–494. doi:10.1112/jlms/jdp039 . Cox, A., De Visscher, M. and Martin, P. (2009). The blocks of the Brauer algebra in characteristic zero. Representation Theory, 13, pp. 272–308. doi:10.1090/S1088-4165-09-00305-7 . Cox, A., De Visscher, M., Doty, S. and Martin, P. (2008). On the blocks of the walled Brauer algebra. J ALGEBRA, 320(1), pp. 169–212. doi:10.1016/j.jalgebra.2008.01.026 . Cox, A. (2007). The tilting tensor product theorem and decomposition numbers for symmetric groups. ALGEBRAS AND REPRESENTATION THEORY, 10(4), pp. 307–314. doi:10.1007/s10468-007-9051-8 . Cox, A., Martin, P., Parker, A. and Xi, C. (2006). Representation theory of towers of recollement: Theory, notes, and examples. J ALGEBRA, 302(1), pp. 340–360. doi:10.1016/j.jalgebra.2006.01.009 . Cox, A. and Parker, A. (2006). Homomorphisms between Weyl modules for SL3(k). T AM MATH SOC, 358(9), pp. 4159–4207. groups. Journal of Algebra and its Applications, 4, pp. 645–670. doi:10.1142/S0219498805001460 . Cox, A., Graham, J. and Martin, P. (2003). The blob algebra in positive characteristic. J ALGEBRA, 266(2), pp. 584–635. doi:10.1016/S0021-8693(03)00260-6 . Cox, A. (2001). Decomposition numbers for distant Weyl modules. J ALGEBRA, 243(2), pp. 448–472. doi:10.1006/jabr.2001.8857 . Cox, A. and Erdmann, K. (2000). On Ext(2) between Weyl modules for quantum GL(n). MATH PROC CAMBRIDGE, 128, pp. 441–463. Cox, A. (2000). On the blocks of the infinitesimal Schur algebras. Q J MATH, 51, pp. 39–56. Cox, A. (1998). Ext(1) for Weyl modules for q-GL(2, k). MATH PROC CAMBRIDGE, 124, pp. 231–251. Cox, A. (1998). The blocks of the q-Schur algebra. J ALGEBRA, 207(1), pp. 306–325. Barbier, S., Cox, A. and Visscher, M.D. The blocks of the periplectic Brauer algebra in positive characteristic. .